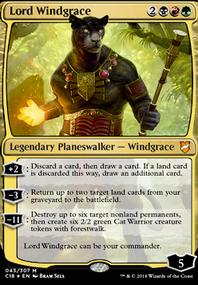 This is the Windgrace deck I’ve been playing for a while. It’s not quite done. There are lots of cards that I definitely want to add, and others that I’m thinking about, but I haven’t added them yet. Those are in the maybeboard. It’s a land-based value deck looking to grind out a long game and overtake the board with massive value. There is a small land destruction package (repetitive Strip Mines and a Wildfire) to help you keep yourself ahead. It plays beat with a full graveyard and has many ways to take advantage of whatever winds up in it. The game closers are pretty typical options (Avenger of Zendikar, Dark Depths, etc.) They shouldn’t be too hard to pick out in the list. Please leave any suggestions, and thank you for your view!